In a sudden shift, North Korea said Saturday it would consider President Bush's offer of written security assurances in return for dismantling its nuclear weapons programs. Pyongyang had earlier dismissed the offer as laughable and "not worth considering." The abrupt change brightens prospects for restarting talks to ease tensions in the yearlong standoff over North Korea's nuclear programs, which some experts say could produce several more atomic bombs within months. Separately, the Japanese government said North Korea may have test-fired a short-range missile off its eastern coast Saturday. It would be the third suspected missile launch by Pyongyang this week. A U.S. State Department spokeswoman in Washington declined to comment on the North's latest comment or on the suspected launch. But a U.S. official said on condition of anonymity that the North Koreans normally do such testing in three stages, and this one appeared to have been previously scheduled. North Korea informed the administration of its new position on Mr. Bush's offer through a contact at the United Nations in New York, said an unidentified spokesman for Pyongyang's Foreign Ministry. During a Bangkok, Thailand summit of Asia-Pacific leaders earlier this week, Mr. Bush proposed that the United States, Russia, South Korea, Japan and China would offer written assurances that the North would not be attacked if it promises to dismantle its nuclear program. "We are ready to consider Bush's remarks on the 'written assurances of nonaggression' if they are based on the intention to coexist with the (North)" and offer "simultaneous actions," the North Korean spokesman said in comments carried by the government's KCNA news agency. North Korea has previously said that "simultaneous actions" include economic and humanitarian aid from the United States, opening diplomatic ties, and building a nuclear power plant. It has also said it must include a nonaggression treaty - something the Bush administration has refused. In exchange, North Korea has said it would declare its willingness to give up nuclear development, allow nuclear inspections, give up missiles exports and finally dismantle its nuclear weapons facilities. The North Korean spokesman said it was "premature" to talk about whether his country would return to six-nation talks. Pyongyang must first confirm that the United States will take "simultaneous actions" toward ending the nuclear crisis, he said. "Simple and clear is our request," the North Korean spokesman said. "What we want is for both sides to drop guns and establish normal state relationship to coexist peacefully." North Korea was now "in the process of ascertaining the real intention of the U.S.," he said. U.S. officials pledged to maintain their New York contact with North Koreans, he added. South Korea welcomed the North's comments. "This is a positive development ahead of future six-party talks," said Ban Ki-moon, President Roh Moo-hyun's adviser on diplomatic affairs, according to South Korea's Yonhap news agency. 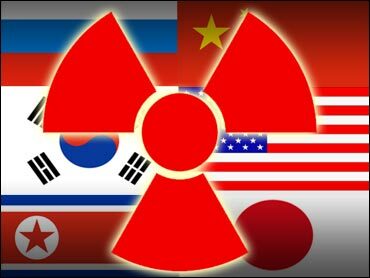 Representatives of the United States, China, Russia, Japan and South and North Korea met in Beijing in August for their first round of six-nation talks aimed at ending the North Korean nuclear crisis. But the meeting ended without agreement on a new round, as the United States and North Korea failed to narrow their differences. Washington demanded that North Korea first shut down its nuclear program immediately while Pyongyang said it would do so only after the United States signed a formal nonaggression treaty and granted economic aid. In recent weeks, North Korea added urgency to the crisis by declaring that it is using plutonium extracted from its 8,000 spent nuclear fuel rods to build new atomic bombs, besides the one or two it is already believed to possess. Last week, it threatened to test a bomb. Mr. Bush made his overture amid international efforts to bring North Korea back to the negotiating table. Wu Bangguo, head of China's legislature and the Communist Party's No. 2 man, will travel to Pyongyang next week to encourage North Korea to return to the talks. The nuclear dispute flared last October, when U.S. officials said North Korea admitted having a secret nuclear weapons program in violation of international agreements.